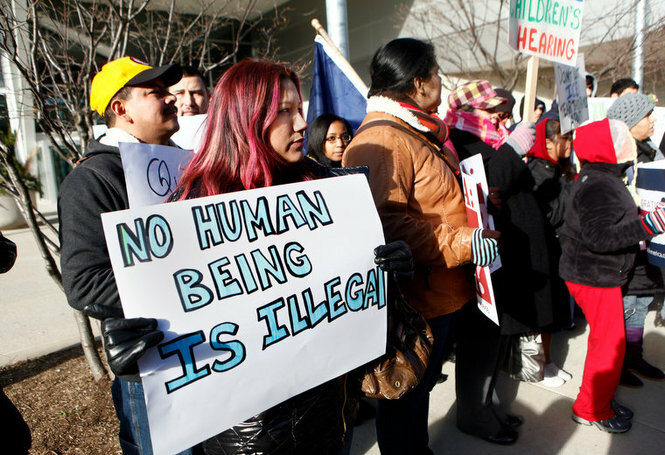 Our friends at Cooking Together, the UUA GA 2012 immigration and justice resource blog published this story about a congregation in Michigan helping stay the deportation of a mother whose children are in need of long-term medical care. - Ed. Posted in Witness and Action, Your Recipes on January 25th, 2012 by Gail Forsyth-Vail – Be the first to comment | Edit Within the last year, the Michigan Unitarian Universalist Social Justice Network (MUUSJN) has partnered with the Alliance for Immigrants Rights and Reform Michigan to educate Unitarian Universalists about immigration reform. On December 28, 2011, members of the alliance had an opportunity to take action that got positive results! MUUSJN and local Unitarian Universalists from All Souls Community Church of West Michigan attended a rally in Grand Rapids to stand up for three small children and their immigrant mother, Victoria Lorenzo-Calmo. In this post, Randy Block, Director of MUUSJN, tells the story.- Ed. Victoria Lorenzo-Calmo fled to America in 2001 after being brutally abused by her ex-husband. After coming to the United States, Victoria met and married a man from Guatemala who appreciates and loves her. Until recently, they lived in Grand Rapids, MI with their three children, who are American citizens. Earlier this year, her husband was deported to Guatemala. Until recently, she awaited her own deportation hearing. Every time the phone rang, Victoria feared it might be the Immigrations and Customs Enforcement (ICE) calling to tell her that her immigration date had arrived. Two of Victoria’s children were born deaf. Both have had cochlear implants. While the six-year old daughter has had her hearing restored, the 14-month old son still needs the four years of follow-up medical care and therapy following his procedure. Facing deportation, Victoria was faced with an impossible choice: to return with her three children to Guatemala where the advanced medical procedures her children need are unavailable or leave her children in the United States without a mother. Responding to a call to stand on the side of live and compassion, Unitarian Universalists rallied in support of Victoria and her children. Within 24 hours of the rally, the Grand Rapids press reported that ICE had issued a memo that granted a one year stay from deportation. An attorney working with Victoria observed that while no formal reason for the stay was given, he said he was “sure it was because of humanitarian concerns involved and also the publicity” generated in this case. In December, MUUSJN was awarded a $5,000 grant by the UUA Fund for Social Responsibility to “Engage UUs for Immigration Reform” in Michigan. They will offer education, training and witness events in partnership with local immigration reform organizations. MUUSJN will also offer a workshop on immigration justice for youth at the Heartland District JusticeCON to be held March 2-4 at the First Unitarian Universalist Congregation of Ann Arbor.